Is Apple Developing Game Controls for the iPad and iPhone? Watch out Nintendo and Sony, an Apple patent for a game-related accessory could make the iPhone or iPad considerably more appealing to enthusiasts. The patent, filed by Apple on September 30 and noticed yesterday by Patently Apple, describes a rectangular bracket with a D-pad and control buttons that wraps around a "portable electronic device" with a touchscreen--something that could turn an iPhone or iPad into a Nintendo DS or Sony PSP killer. Imagine snapping the iPhone or iPad into a gamepad-like shell, one that allows you to play the sort of sophisticated games--fighters, first-person shooters, platformers--that work best with tactile features like analog thumbsticks and depressible buttons. It gets better. 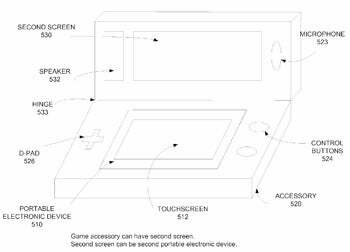 Apple's patent starts out talking about "buttons, joysticks, and D-pads" but goes much further, suggesting the apparatus could include a microphone, cameras and camera lenses, speakers, rumble feedback, motion detection, and--wait for it--a second screen like Nintendo's DS. After diagramming potential configurations, Apple admits that portable devices with touchscreens "can...be somewhat awkward" while playing games. "The same screen used for viewing an avatar's activities is used to control the avatar," writes Apple. "This arrangement causes the user's fingers [to] block the action. "Thus while these portable electronic devices include a highly efficient interface, when playing games it is often desirable to have a more specialized user interface." "Often"? If the game's named Street Fighter IV or Doom 3, try "always." Cleverly designed, a wraparound "gamepad" for Apple's iPhone or iPad could upend the portable games market by stealth-catapulting the iPhone into direct competition with the DS and PSP. Sign me up. The sort of games I prefer aren't the kind currently in vogue for Apple's handhelds. The iPhone games tend to be too basic, too mechanically simplistic, and when it comes to fine motor fiddling, your fingers work less like a dancer's feet than a pair of clumsy galoshes. Overlay buttons your fingers can feel and depend on, and you introduce a kind of familiar mechanical finesse a flat touchscreen will never match. Apple's i-family devices pack serious power under the hood. Complementing or outright bypassing the company's breezy touch interface would represent more than just a mimetic threat to Nintendo and Sony. Apple's mobile display technology is unrivaled. If this patent's for real and Apple's serious about it, keep your eyes peeled for the coup, even if it comes slathered in more Jobsian "magical" rhetoric.